With recent developments in technology, the D Plane is covering serious ground in the golf world in defining ball flight. Although it is controversial with the old PGA's ball flight laws the D Plane has been instrumental in helping golfers to understand why a golf ball behaves the way it does. How will this new information benefit you? It will show you how you are able to hit a draw, fade, hook, slice, or a straight shot. To put this in perspective you will be able to setup for a variety of shots and understand what needs to happen to produce a certain shot or explain why a shot occurred. 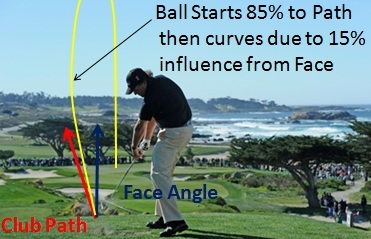 The PGA's definition of Ball Flight Laws is "the ball starts in the direction of the club path and the ball will curve if the face is pointed in a different direction at impact." 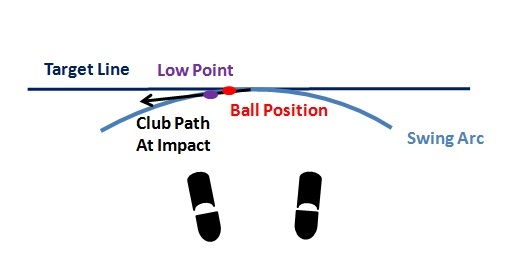 In this picture, according to the PGA Ball Flight Laws, the ball would have started in the direction of the path and then curve back to the target because of the face being aimed at impact in another direction. The D Plane in simplicity states "that the ball starts 85% to the club face, and has a 15% influence resulting from a club's path." You can find this information on TrackMan Page 2 of their newsletter. 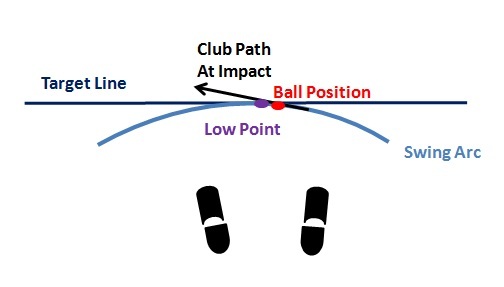 Notice the blue line is the face angle(direction in which face is aimed at impact) and the red line is the club path(direction the clubhead is moving at impact). Both of these lines point left of the target line but the difference is the face is closed to the path but open to the target line. 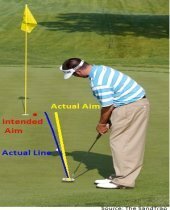 Since the club face is closed to the path at impact and we assume that the ball is hit with centered contact, the ball will start 85% toward the face(which is left of the target) and will then curve back to the target because of the path of the club being further left than the face. One of the best demonstration videos out there on the d-plane is one done by James Leitz below. In order to fully grasp the d-plane concept, you must look at how the sweetspot changes during the downswing. As the club approaches the ball (right handed golfer) it is moving downward, forward, and outward then after it reaches the bottom of the arc known as "low point" the club head starts to move inward and upward. The key to working the ball is being able to adjust the baseline (horizontal swing plane). In this picture the club contacts the ball on the backside of the arc, therefore, it is moving downward, outward, and forward. In result, the path of the club is moving to the right and if face angle is closed to the path there will be a Draw. The second picture shows the club making contact with the ball on the forward side of the arc. This means the club is traveling inward and then upward. In result, the path of the club is moving to the left and if the face angle is open to the path there will be a Fade. The next time you go to the driving range or play a round of golf, be sure to watch your ball flight. 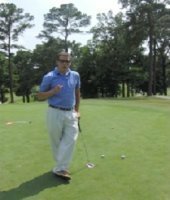 By applying these principles of the d plane you will now be able to understand what is happening at impact and if needed you will be able to fix an erroneous ball flight.